Take a sneak peek at the incredible auction items for this year's event! New details and items will be added soon. 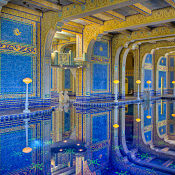 Jump into this once-in-a-lifetime opportunity – swimming at Hearst Castle’s indoor Roman Pool with 9 of your friends! Completed in the early 1930s, you will be surrounded by the beauty of shimmering gold and blue mosaic tiles and statues of Roman gods and goddesses. This private event would be the perfect way to celebrate any occasion or provide a special treat for out of town guests. 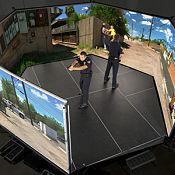 Spend 2 hours in the VirTra300 Firearms Training Simulator, used by law enforcement and military to prepare them for real world situations. You will experience 5 life sized screens which provide 300 degrees of visual awareness and 360 degrees of surround sound to make it as close to real life as it gets. This is a one of a kind experience not offered to the public. 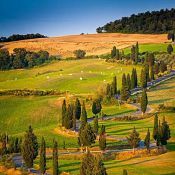 Enjoy the beauty of Tuscany at "La Malpensatina" villa in Radda-in-Chianti in the heart of Tuscany, the ideal location to experience Tuscany, with Sienna and Florence less than an hour away. This incredible 400-year old stone farmhouse features five bedrooms and four full baths. Stroll through La Malpensatina’s thirty acres of vineyards, enjoy the quaint town of Radda or venture to Sienna and Florence, only 30 minutes to an hour away. The ideal central location to explore all that Tuscany has to offer! Head to Nashville, Tennessee with two tickets for the biggest night in county music! The CMAs are held at Bridgestone Arena and your tickets will be in Sections 301-307 or 328-332, located in the upper deck. Includes roundtrip airfare and a two night stay in downtown Nashville. **Specific November 2018 date to be announced by the CMA Awards. 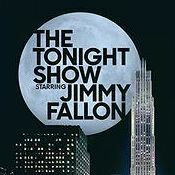 Head to New York City with two VIP tickets to see The Tonight Show Starring Jimmy Fallon, filmed at the famous Rockefeller Plaza. Check out the sights of the Big Apple while staying at the Sheraton New York Times Square Hotel for two nights. 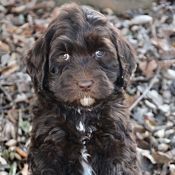 This loveable female, chocolate brown Australian Labradoodle is nine weeks old and will weigh approximately 30-35 pounds at maturity. She is microchipped, spayed and has had one set of immunizations. Don't miss your chance for unconditional love and unlimited cuddles from this sweet girl! With one of the best views of Pismo Beach, you and 5 friends will enjoy the sunset at Oyster Loft as you indulge in a five course, wine paired dinner prepared by Chef Jared Hurst. 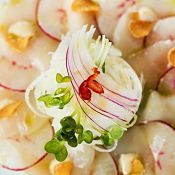 Known for their fresh seafood, your menu may include some of Oyster Loft's well-known dishes - spicy tuna poppers, fresh oysters, scallop carpaccio or soy glazed salmon. Sure to be a delicious and memorable evening! A one-of-a-kind Jerry Scott original painting! Jerry Scott is a co-creator and cartoonist of the Baby Blues and Zits comic strips. He toured Hearst Ranch before creating this painting, especially for this event, and was inspired by the beauty of the hills and the rich sense of history. His portrayal of the ranch highlights the ranching legacy of the American West. 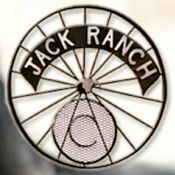 Two lucky hunters will head to Jack Ranch for an exclusive overnight adventure – a one night, two day guided wild pig hunt on this historic 72,000 acre ranch in Cholame, CA. This is an exclusive opportunity on an expansive and historic property which is not available to the public! 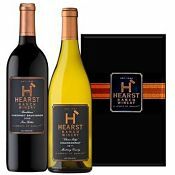 Take home a special ice chest filled with Hearst Ranch goods: baseball caps, vests, beef jerky, aprons, raw hide coasters, chocolates, olive oil and vinegar, wine glasses, a Hearst Ranch book, and a gift certificate for Hearst Ranch Wine! Items subject to change. 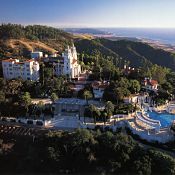 Six lucky people will experience a special private tour of Hearst Castle with a knowledgeable guide. Learn about the rich history of this incredible hilltop masterpiece. Then head to Robin’s Restaurant in Cambria, to enjoy a delicious dinner paired with wine. 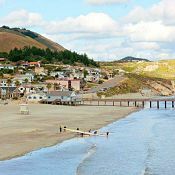 Enjoy walks on the beach and fun in the sun at this beautiful luxury condo in lovely Avila Beach. Just steps from the sand and boardwalk, this two-bedroom, two-bath condo with spectacular ocean views and is ideal vacation setting. Centrally located, you will be surrounded by delightful oceanfront restaurants, shops, and tasting rooms, as well as beaches, hiking trails, and spas. 2 bedrooms; sleeps 6. Mutually agreeable date. 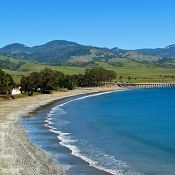 Enjoy a private Hearst Ranch Wine tasting and a mouthwatering picnic lunch at Beach House #1 in San Simeon Cove on a lovely Friday afternoon. Partake in an informative wine tasting experience with scrumptious appetizers followed by a specially selected picnic lunch courtesy of Hearst Ranch. Enjoy the festivities while taking in your breathtaking surroundings! **Specific date - Friday, May 25, 2018.